Written for Coursera (MOOC) Class ‘Global Sustainable Energy, Past, Present and Future ‘ by University of Florida (June 2013). Iceland is unique and interesting place for many reasons, cultural, geological and economically. Highest electricity consumption per capita in the world, more than double Norway’s, 2nd highest. Traditionally, Iceland’s main industry has been fishing and more recently Aluminium production. The clip from the film ‘Dreamland’ highlights some of the opposing views that are currently being debated in the country. Aluminium smelting and Hydroelectricity, also Environmental Protection and Geothermal Energy are hot topics. The geography and climate of Iceland lends itself to hydroelectricity production on a large enough scale to meet the majority of the country’s power needs. Hydro accounts for 12,500 GWh annually, 73% of total electricity generation. A consequence of Iceland’s geological activity is that it is able to harness heat from below the earth to generate electricity and heat houses. It is used to produce the remaining 30% of electricity generation, annually 4,700 GWh. In addition to this, a further 11, 700 GWh are produced as heat for residential space heating, as well as warming greenhouses and swimming pools, etc. 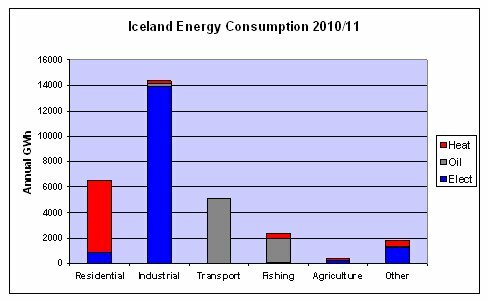 The table below shows the national energy mix for Iceland in 2010/11. The Aluminium industry in Iceland began in 1969 when the smelter at Straumsvík opened. A further two Aluminium plants were opened in 1998 and 2008. As can be seen from the graph below, Aluminium production is by far the largest consumer of electricity and total energy in the country. Aluminium smelting requires vast electricity input, and Iceland’s potential for hydro-generation provided a good economic match. If Aluminium industry consumption is discarded, the Electricity per capita falls to 12,500 kWh annually, which is marginally above that of the USA. As can be seen from Figure 1, Iceland still relies heavily on imported petroleum for most of it’s transportation mainly for automobile and air travel. The Icelandic fishing industry is also a major oil consumer, required to power the fishing fleet. There are some hydrogen filling stations already in Reykjavik, which indicates that the country is working towards 100% clean indigenous energy. 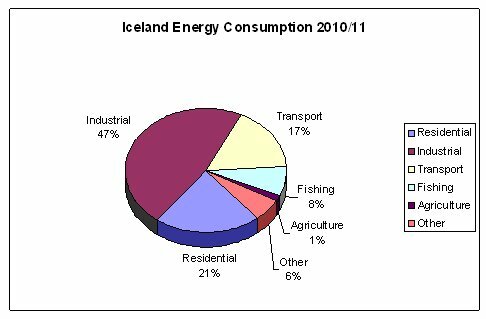 As seen in Figure 2, Industry currently uses nearly half of all the energy consumed in Iceland. 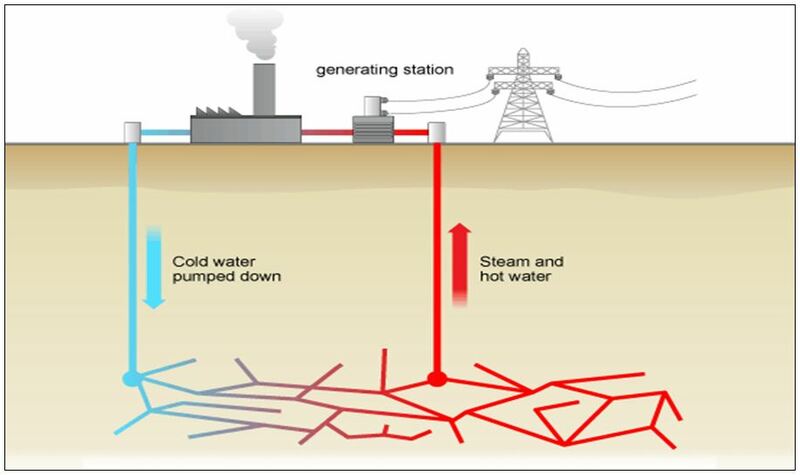 The government estimates that there are over 20,000 GWh as yet untapped geothermal generating capacity. Since the population growth rate has hovered around 1% since 1960, and is currently 0.3% (World Bank Data), it seems likely that when this additional energy is exploited, it will be used in industry, therefore increasing the fraction of total energy consumed by the sector. 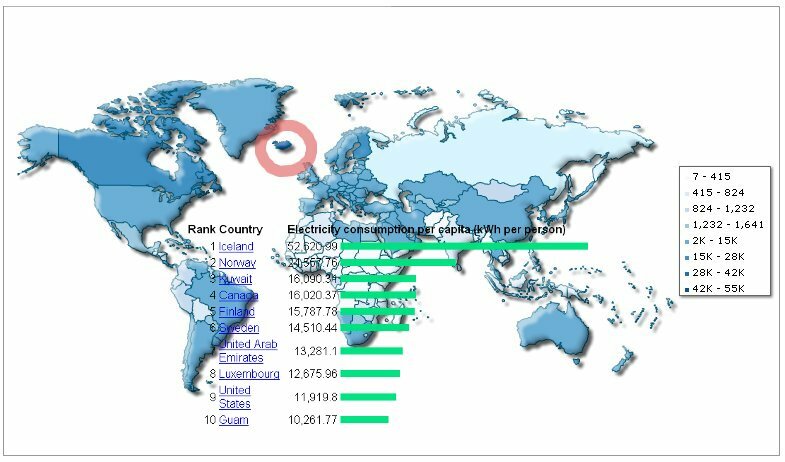 The figure for Icelandic electricity consumption per capita, see Figure 3, seems astonishing when compared to the other nations in the top ten. However, the fact that this quantity of energy consumption is 100% renewable, all the more remarkable, is a success story from which other nations can benefit. Iceland is interested in exporting this energy in some form, they are investigating an interconnector cable to the UK and possibly mainland Europe. They are also trying to attract energy hungry business to their shores. They are world leaders in Geothermal Energy, which has great potential across the globe as a source of clean renewable energy. Oil drilling technology can be adapted to reach into the hot sedimentary rocks, which heat pumped water, which emerges as steam to power turbines and generate electricity.